I know at times it may seem like we’ve been a little hard on Elio, the plucky startup that wants to make cheap, efficient three-wheelers. We’re all for that general idea. The more weird, cheap cars, the better! But when Elio starts using phrases like “up to 84 MPG,” I have to cringe. Elio seems to have started using this particular turn of phrase on their website and advertising fairly recently. They’ve always stated that their goal would be to get to 84 MPG for their three-cylinder powered car, but now that they’re saying “up to” 84 MPG, all credibility is gone. The use of “up to” is one of the best indicators that someone isn’t being honest with you. “Up to” is a deliberately confusing choice of words, because it means almost nothing. A brand-new Mercedes-Benz G-Wagen could, hypothetically, get “up to” 84 MPG, too, it’s just that unless you’re towing it, it’ll probably get something closer to 12 MPG. “Up to” defines an upper limit, as the words suggest, and in no way makes a claim that the number in question is actually what you would get in real use. This is very different from MPG estimates that the EPA uses. While the EPA admits the numbers are estimates and that your mileage may (really, will) vary, the numbers given are the result of testing and are averages, not some hypothetical upper limit. ... which actually means “save between 0% and more than 10% on gas!” These are the same results you’d get by plugging your thumb into your car’s 12V outlet. 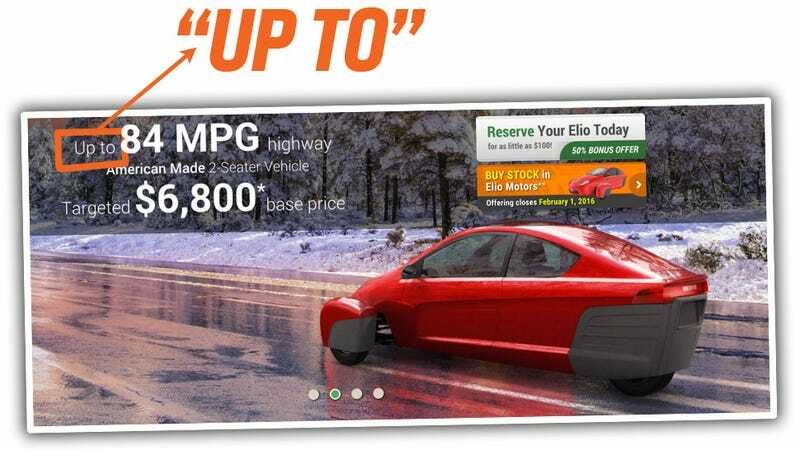 Elio plastering Up to 84 MPG on their websites and ads is very disheartening. It shows that they have no actual confidence or proof that their car will get 84 MPG, but they really, really want to keep saying that. If the Elio gets 70 MPG, their ads are true. If the Elio gets 5 MPG, the ads are just as true. The statement is absolutely meaningless. Interestingly, the only way their claim isn’t true is if, somehow, the Elio does better: 90 MPG makes their statement false. “Elio’s claims of up to 84 MPG are totally true! I drive an Elio and get nearly 22 MPG! That’s below 84 MPG! Thank you, Elio! ... then I think we can see that Elio is trying to confuse us, at least a little bit. Maybe the car will be fantastic. I hope it is. But they’re not going to convince anyone with cheap linguistic tricks like this.